I have pointed out earlier, gold is forming a possible short-term top. It is on the verge of completing a bearish ‘Head and Shoulder’ pattern. The pattern is confirmed if gold closes below $1220/oz. The downside pattern target for this setup is $1138/oz. If gold starts to rally and breaks out to the upside, then we should see the $1396 level be reached based on technical analysis. I will open a new long gold position when the time feels right. With technical analysis strongly suggesting gold and silver have bottomed, New breakouts to the upside in metals and mining stocks can be bought. On the other hand, silver has formed an almost perfect cup and handle pattern and has broken out of it. It has reached its first target objective; chances are that silver will either consolidate or pullback after having met its target or move up to $18.70/oz. 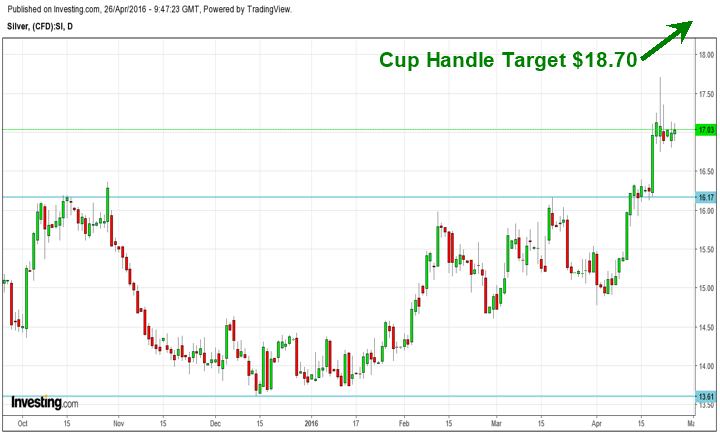 levels, which is the pattern target of the ‘Cup and Handle’ pattern formation. However, new buying is not advised at current levels due to a poor risk-reward ratio. If we take a look and monitor the gold/silver ratio closely, recently, the ratio had touched its resistance of the past 20 years. Every time the ratio has returned from the resistance, the minimum it has retraced is to the levels of 45. There are no reasons to believe that it will be any different this time around. Hypothetically, if gold were to remain at $1236/oz. 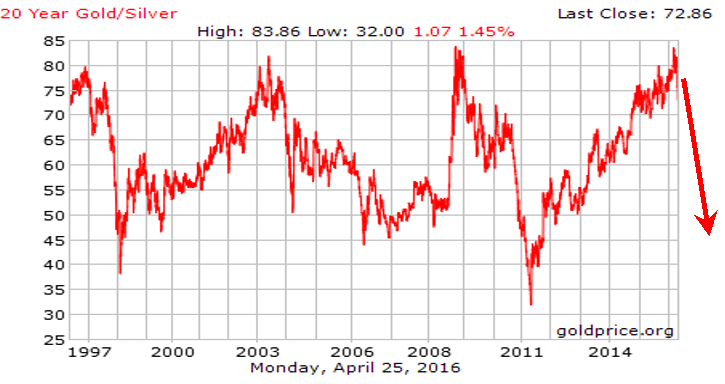 and if the ratio corrects to 45, silver will reach $27.5/oz., which is a 62% increase from current levels. Hence, it is prudent to stay with silver for a better return compared to gold once price has a pause to regroup before the next rally. Buying gold and silver offer different rate of returns to the investors. If an investor is able to time both the precious metals, then the total returns will be ‘astronomically high’ in the future. My timing ‘cycles’ provide signals both for the short-term and the long-term. The price action of both gold and silver along with my cycles have been showing VERY strong “Cycle Skew”, which I explain in detail in my book “Technical Trading Mastery”. This cycle skew is telling us that precious metals are now in a strong uptrend and is another confirming indicator that support much higher prices long term. During the first half of a bull market trading price patterns and upside breakouts tend to work very well. Because interest in the sector is growing and more buyers continue to enter that market, price pattern breakouts are the last chance to get a position before price has its next rally higher. I will continue to inform my subscribers of new swing trades, and even more importantly the long-term investing Set-It-And-Forget-It ETF trades to ride out the new bull and bear markets for massive profits. The post The Next Technical Price Targets for Gold & Silver appeared first on ETF Forecasts, Swing Trades & Long Term Investing Signals.